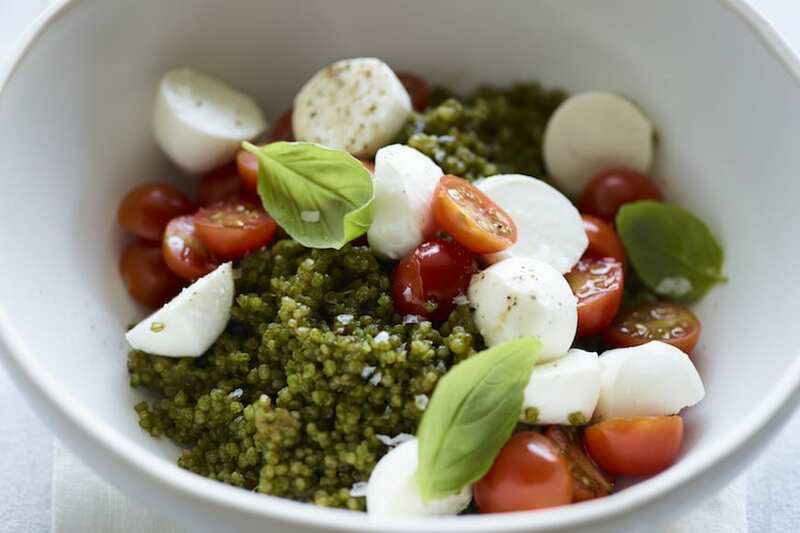 This Pesto Caprese Quinoa Salad is on deck today and these are EVERYTHING! My sister is constantly asking me to develop more recipes that are easy to make on the weekend and can be taken to work throughout the week – so obviously, as a good sister, I’m happy to oblige! She works, doesn’t LOOOOOOVE cooking and really doesn’t have time to cook on a daily basis, so prepping ahead on the weekend is her jam! 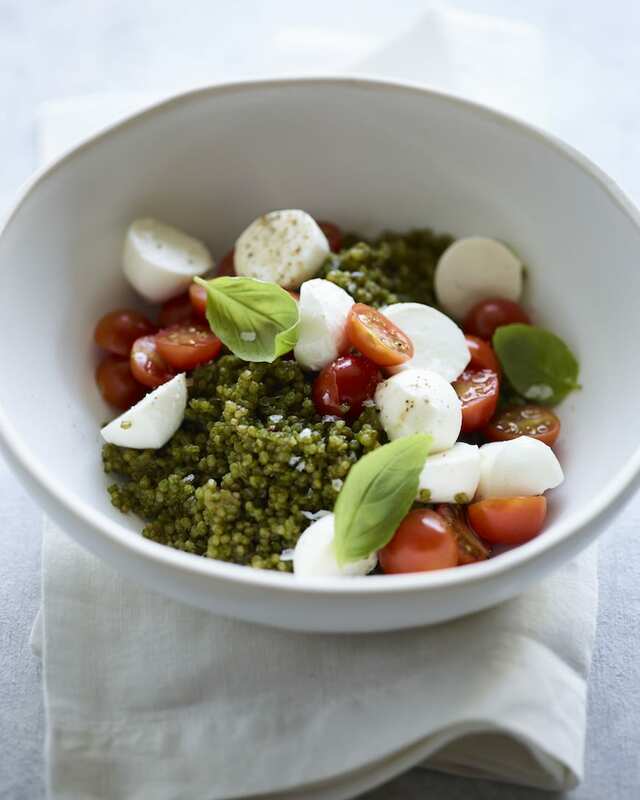 This Pesto Caprese Quinoa Salad is one of those recipes I’ve been making since college, and I’m obsessed and it’s perfect for a prep-ahead moment. It’s beyond easy. My favorite basil vinaigrette recipe gets mixed with some cooked quinoa and then just toss in some fresh mozzarella balls and some cherry tomatoes!! And that’s the Pesto Caprese Quinoa Salad in a nutshell!! Those of you new to basil vinaigrette, get ready, it’s a game changer. I make a batch every week and use it for all sorts of things like this quinoa situation, I throw it on top of fish and chicken, use it as a salad dressing, you name it. Just a quick word to the wise – when you’re prepping this ahead of time, don’t add the tomatoes to the mixture until the day of. Tomatoes should always be stored at room temperature so you just want to add them right before you eat. When you refrigerate them, they loose their flavor and ain’t nobody got time for that!! More of my favorite make ahead work lunches are right HERE! Once the quinoa has steamed, transfer it to a bowl and set aside. Make the basil vinaigrette according to the recipe instructions. Combine the basil vinaigrette with the quinoa and toss to combine. Spoon into a bowl and top with the cherry tomatoes and fresh mozzarella. Season with salt and pepper as needed. Serve immediately or refrigerate and serve at a later time. One Pan Tandoori Chicken with Spiced Coconut Rice The BEST Black Bean Chili!